This is an original glass slide that was sent to a movie theater in Green Bay, WI between 1916 & 1918 to show between films giving current news and events. 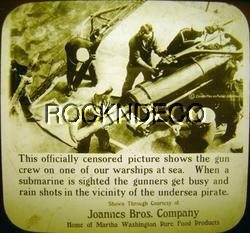 This glass slide's caption is "This officially censored picture shows the gun crew on one of our warships at sea. When a submarine is sighted the gunners get busy and rain shots in the vicinity of the undersea pirate." "Shown through courtesy of Joannes Bros. Company - Home of Martha Washington Pure Food Products". 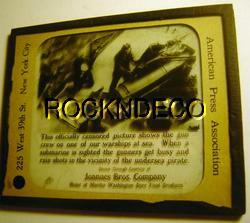 This glass slide was produced by the American Press Association of New York City. The slide measures 3-1/4" x 4". The glass slide is in good condition - there is some light dirt and a few small marks - there is a 1/2" mark near the bottom that could be a hairline crack, but noth sides of the glass are smooth, so it would have to be inside - the edging tape on the bottom is a little uneven. A NICE PIECE OF WORLD WAR I / NEWS MEMORABILIA! Postage is $3.50. Each additional slide would be one more $1 to ship.